A variety of materials are used in a knee implant including polyethylene, metal alloys and most recently, ceramics. The metal parts of the implant are usually made of titanium or cobalt/chromium based alloys, while new designs use ceramics. The plastic parts are made of ultrahigh-density polyethylene. All together, the components weigh between 15 and 20 ounces, depending on the size selected. The construction materials used must meet several criteria. First, materials used must be biocompatible. That is, they can function in the body without creating either a local or a systemic rejection response. Next, the material’s mechanical properties must be able to duplicate the structures they are intended to replace. For example, they must be strong enough to take weightbearing loads, flexible enough to bear stress without breaking and able to move smoothly against each other as required. Finally, the materials must be able to retain their strength and shape for a long time. The chance of a knee replacement lasting 15 to 20 years is about 95 percent . Metal-on-polyethylene components are the most commonly used weight-bearing surfaces. A cobalt chromium tibial component articulates with a polyethylene bearing surface. Historically, polyethylene produced the most wear debris and osteolysis, but over the past decade, improvements in the sterilization and development of polyethylene have made it more resistant to wear. Highly crosslinked ultra-high-molecular-weight polyethylene (UHMWPE) is the standard bearing material used. Newer polyethylene designs show reduced wear in stimulator studies, but there is no long-term clinical data supporting the superior wear characteristics. Polyethylene is the least expensive implant and the larger the polyethylene molecule the more resistant to wear it becomes . UHMWPE possesses many properties, including high abrasion, toughness, low density, ease of fabrication, biocompatibility, and biostability which make it a good material explaining its popularity. However, with wear rate and assuming the polymer particle size is 1x1x10 um, it can be shown that more than 51 million polymer particles are produced each year. After elimination of most of these particles by the body’s host response, large numbers of them still remain in the body tissues. It is thought that these particles are phagocytosed, resulting in reactions such as forming grannulamatous lesions, osteocytes, and bone resorption causing loosening of the entire total knee implant . 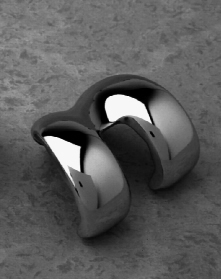 The metal-on-metal implants consist of a chromium cobalt tibial surface and femur bearing surface. Metal-on-metal designs date back to before Charnley’s low-friction arthroplasty, but the surgeons using these components abandoned them for metal-on-polyethylene due to early failures. Most of these early failures were secondary to design flaws rather than materials. After polyethylene wear particles became implicated in osteolysis, many surgeons became re-interested in metal-on-metal bearings. Metal-on-metal bearings have been reported to have 20-year survivorship of 77% to 84%, which is comparable to metal-on-polyethylene. These bearings produce very small amounts of wear debris, and the wear rate actually improves with time once the bearings finish the “breaking in” period. Corrosion particles can be generated from any metal surfaces, but they are most commonly seen with metal-on-metal articulations. The small metal wear products and corrosion particles still stimulate the inflammatory process that causes osteolysis but to a lesser degree than polyethylene. Another concern is the systemic effects of high levels of metal ions in the serum and urine following metal-on-metal total knee arthroplasty. Jacobs et al reported levels of serum chromium and serum cobalt to be respectively 9 and 3-fold higher in a 20-year follow-up study for metal-on-metal TKA patients compared to that of controls. No adverse effects have been reported with over twenty years of clinical use and this topic is under intense investigation . Ceramic-on-ceramic bearings have even lower wear rates than metal-on-metal articulations. Less is known about the local response to ceramic wear particles. Ceramic articulations generate less wear debris but they do appear to stimulate the cascade that results in osteolysis. The cost of ceramic and metal articulations is currently much greater than that of metal-on-polyethylene . Ceramics are synthetic materials, used in industrial applications. They are made from very fine particles of alumina and zirconia. These two types of ceramics are commonly used. Fine particles of either material are pressed together under extreme pressure and heat. The resulting material is very hard, and can be polished to a very smooth surface that has lower friction than any metal that we use in orthopaedic bearings. As a result, when ceramic is used with polyethylene in total knees, or when ceramic is used with ceramic itself, the wear rates are very favorable and the long term outlook for the implant is improved . 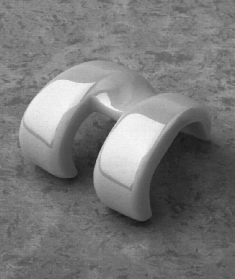 The advantages of ceramic bearing surfaces in terms of superior lubrication, friction, and wear properties compared to cobalt-chrome alloy surfaces in total joint arthroplasty are well recognized. Laboratory and clinical data have shown that ceramic bearings are associated with fewer wear particles that incite a less intense inflammatory host immune response than the metal-on-polyethylene articulations that are the accepted standard in total knee replacement surgery . Periprosthetic osteolysis and aseptic loosening are the biologic and clinical manifestations of the body’s reaction to particulate wear debris generated from the metal-on-polyethylene articulation. Also, speculation exists that metal particles in the body, caused by metal on metal combinations, may be associated with the potential for carcinogenesis and delayed hypersensitivity reactions. However, ceramic parts have fewer options in terms of size variations and other parameters that the surgeon may find useful. Other bearing surfaces, such as highly cross-linked polyethylene, offer the same superior wear characteristics as ceramics. At the present time, the preferred bearing surface is the highly cross-linked polyethylene on cobalt-chrome, because a number of style and sizing options are available to fit the needs of patients . Ceramic-on-ceramic bearings have improved significantly since their first use more than 30 years ago. Early designs had some difficulty with cracking. Ceramic is more brittle than the other bearing surfaces. The fracture problem has been nearly eliminated in new designs. Despite good clinical results, ceramic-on-ceramic bearings are not yet approved in the United States for widespread clinical use . Bone cement is used as a means to stabilize components and fix them to the host bone tissue. This method of fixation is loosing popularity. Cementless components, also called “press fit,” encourage bone to grow directly into the metal. Most of these components have a roughened surface, which increases surface area. They are often covered with an osteoconductive substance such as hydroxyapatite, which encourages bone in-growth and solid fixation. The use of bone cement, poly methyl methacrylate, is dependent on the clinical situation and surgeon preference. Cemented femoral components are still probably the most common method of fixation, but cementless components are becoming increasing popular and have similar longevity. Kawamure et al reported 90% survival of cementless components at 14 years. Cemented components have been shown to have high rates of loosening and need for revision .